BEIJING, CHINA--(Marketwired - Dec 15, 2016) - China Oceanwide (together with its subsidiary, "Oceanwide Resort Paradise HI LLC") entered into a management agreement today with subsidiaries of Kerzner International Holdings Limited ("Kerzner"), a leading international developer and operator of destination resorts and ultra-luxury hotels, for a new, Atlantis resort in Ko Olina, a 642 acre development on the white sand beaches of the island of O'ahu in Hawaii. This new generation of distinctive luxury will offer a sophisticated lifestyle experience for resort guests, residents and visitors, with infinite ocean views, accented with lush green spaces and endless water experiences, encapsulated in Hawaii-inspired iconic architecture and themed programming. 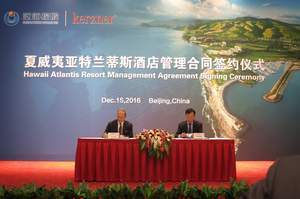 This will be the first Atlantis resort in the United States, along with the brand's flagship in Dubai, Atlantis, The Palm and the new icon in China, Atlantis, Sanya Hainan which will open in 2017, as well as The Royal Atlantis Resort & Residences in Dubai. Kerzner has plans to continue to grow and develop the Atlantis brand globally. "Atlantis resorts are iconic entertainment destinations that significantly contribute to the surrounding community, and Hawaii will be no exception," commented Jean-Gabriel Pérès, President and Chief Executive Officer, Kerzner International. "Ko Olina is an incredible project with exceptional partners in global leaders China Oceanwide and The Resort Group. Atlantis will astonish and amaze, as well as celebrate the history and culture of Hawaii. An unsurpassed location will provide endless wonders, with its magnificent sense of discovery, whilst also pioneering previously unseen experiences. I am proud we are bringing Atlantis, a must-see resort, to O'ahu." Overlooking both the stunning Honu and Kohola Lagoons, Atlantis will offer a sense of awe-inspiring discovery, encompassing over 26 acres of unparalleled excitement and larger than life experiences, revolutionary water play in Aquaventure Waterpark, The Ambassador Lagoon and The Lost Chambers Aquarium and incredible dining experiences. Already a leading holiday destination, the addition of Atlantis to Ko Olina will continue the area's transformation as the new centre for entertainment in Hawaii with the addition of this new trailblazing landmark. "Oceanwide is honored to partner with The Resort Group and Kerzner in bringing one of the world's most prestigious and quality resorts -- Atlantis -- to the state of Hawai'i. We believe strongly that Atlantis will bolster the already strong tourism market, increasing visitor spending and adding much-needed hotel rooms to the island," said Steven Wang, senior vice president, Oceanwide Resort Paradise HI LLC. "As the first of several major projects Oceanwide is introducing to Hawai'i, we are committed to collaborating with our partners and becoming an active, long-term contributor to the local community through our developments." 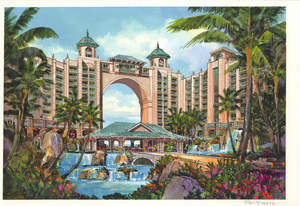 The Atlantis brand has truly defined integrated entertainment destination resorts. Each Atlantis resort rises majestically out of the sea, the flagship, Atlantis, The Palm atop the apex of Palm Island in Dubai, and in Sanya, People's Republic of China, rising from the South China Sea, as well as the new Royal Atlantis Resort & Residences in Dubai. Atlantis Ko Olina will be inspired by Hawaii's legacy of ocean exploration. A vibrant tribute to an aquatic world of wonder, Atlantis resorts are unique, ocean-themed destinations offering a wide variety of entertainment experiences with restaurants by world-renowned chefs; a vibrant range of bars and lounges; extensive slides and rides at Aquaventure Waterpark; fresh and salt-water pools, lagoons and marine exhibits, including an open air marine habitat. Guests from around the world will also discover superb accommodation, an indulgent spa, luxury boutiques, magnificent event spaces and endless stretches of beach as Atlantis showcases a dazzling, imaginative world of fun for all ages. Inspired by the ocean, providing contemporary elegance, Atlantis Ko Olina will celebrate the incredible natural elements of Hawaii's environment, landscape and architecture and its distinctive heritage and character. With approximately 800 luxurious guest rooms and suites, as well as approximately 524 residences, Atlantis Ko Olina will introduce a new luxury lifestyle experience to the region. Guests and residents will be able to enjoy a variety of unique amenities, from private gardens and private pools to a variety of cutting-edge experiences to the ultimate Beach Club. Luxury retail boutiques will be curated to offer a wide and interesting selection for shopping pleasure in Ko Olina. The resort will also house an indulgent Spa, introducing traditional and holistic practices fused with modern spa therapies, as well as a state-of-the-art fitness centre. Younger guests will experience their own adventures, from discovering exotic marine life, to culinary lessons, to the latest innovations in technology. In addition, event space will be available for both large and small gatherings, whether for business or for pleasure. "Hawaii is the perfect location for our next Atlantis destination resort. This resort is set to quickly become a new landmark in Hawaii and will introduce the fun, interactive entertainment experiences at the heart of the Atlantis philosophy," said Serge Zaalof, Chief Operating Officer, Atlantis Resorts. "I am thrilled that we are able to continue to innovate on the Atlantis adventure and we are committed to offering unprecedented experiences to resorts guests, residents and visitors alike." The addition of Atlantis will further position Ko Olina as a premier mixed-use destination offering a sophisticated collection of upscale hotels, luxury resort residences, fine dining, alongside four crescent beach lagoons. Ko Olina, or "Place of Joy," spans 642 acres on the island of O'ahu that was once a retreat for Hawaiian royalty and features a unique ocean coastline with white-sand beaches, walking trails and classic Hawaiian ambience. The development also offers the state's largest private deep-draft marina, world-class golf and sports facilities, and shopping and retail centres. "China Oceanwide and Kerzner bring extensive global development experience to Ko Olina," said Jeffrey R. Stone, The Resort Group's founder and master developer of Ko Olina. "This project is extremely exciting for the State of Hawaii and will undoubtedly enhance the entire destination experience at Ko Olina. A project of this scope and quality will heighten O'ahu's recognition as a luxury destination for years to come and broaden Hawaii's appeal to affluent travellers from around the world, including the discerning millennial market." At full build-out, Ko Olina will generate an estimated $6.3 billion in economic impact annually for the city and state, and be West O'ahu's largest employer supporting approximately 30,000 permanent jobs. Ko Olina is already the economic engine and key creator of jobs for the Waianae, Kapolei, Makakilo, and Ewa regions. Atlantis has redefined destinations and introduced innovative, awe-inspiring experiences at each of its locations -- Atlantis Ko Olina will be no exception. Revolutionary water play, interactive marine experiences and a celebration of Hawaii's ocean legacy will be unveiled for visitors, residents and guests. Kerzner International Holdings Limited, through its subsidiaries, is a leading international developer and operator of destination resorts, ultra-luxury hotels and residences and innovative entertainment and gaming experiences. Kerzner's flagship brand Atlantis, includes Atlantis, The Palm, Dubai, a 1,500-room, water-themed resort on The Palm, overlooking the Arabian Sea and mainland Dubai; and Atlantis, Sanya Hainan in China, under development, as well as The Royal Atlantis Resort & Residences in Dubai. Under the One&Only brand, Kerzner manages nine of the top-rated luxury resort properties in the world, located in The Bahamas, Mexico, Mauritius, the Maldives, South Africa, Dubai and Australia. Additionally, Mazagan Beach & Golf Resort, a 500-room destination golf and casino resort in Morocco, is also operated by Kerzner. For more information concerning Kerzner and its operating subsidiaries, visit kerzner.com. Oceanwide is a landowner and community developer working on several projects in West O'ahu. Oceanwide is dedicated to serving West O'ahu -- and Hawai'i -- through thoughtful and sustainable community-oriented development. The company is currently in the early planning stages of three projects, including the Atlantis Resort & Residences in Ko Olina, another beachfront hotel and condominium project in Ko Olina, and a project in Kapolei West. At Oceanwide, the company values of humility, hard work, and reciprocity with the communities it is a part of inform each and every choice the company makes. China Oceanwide Holdings Group, the parent company of Oceanwide, has decades of experience in real estate, energy, culture, media, and strategic investments, with work represented in Australia, China, Hong Kong and Indonesia. As a master developer, The Resort Group (TRG) is known for creating and repositioning distinctive world-class, mixed-use communities. Most notably, TRG has been responsible for reimagining two master-planned communities in Hawai′i -- O′ahu's Ko Olina Resort and Kaua′i's Princeville Resort at Hanalei -- both of which feature a selection of globally recognized luxury brands including Four Seasons Hotels and Resorts, St. Regis, Westin Hotels & Resorts, and Marriott International. Both resorts offer a mix of vacation homes, condominiums, restaurants, retail centers, golf courses and equestrian and outdoor adventures. TRG also operates Resort Air, one of Hawai′i's only private jet and helicopter charter companies with service between Princeville's private airport and all neighbor islands. For more information, please visit www.theresortgroup.com.